As Christmas approaches, and with it the end of a year, it is time to be grateful for the great mercy of God which allows us to serve Him, wherever we are in the world. We are grateful for a positive term at the seminary. Daniel's class on Baptist History and Theology (basically anything that he wants to put under a “Baptist” heading) has often led to quite lively debate. He has also run a class alongside our principal, Pastor Júlio, on New Testament preaching. The end of term at the Seminary, and for the recruitment of new students for the next term. We are grateful for the opportunities to continue to develop the strategic action plan of the Social Action Department. Since our last newsletter, we have had the opportunity to introduce the concept of local church community work in two different churches in very distinct regions of Lima. The Social Action Department, especially for plans for a stand at the next Peruvian Baptist Assembly. an interim supervisor. The team are working at the school run by our church and helping out with various church-related activities. We thank the Lord for the way the church has welcomed the team and the good relationships they have built up. The Action team as they continue to work at the school and the church until March. In our last email, we mentioned that Regiane needed to undergo a hysterectomy. This operation took place on October 10th and she is recovering well, although the first few weeks following the surgery were quite painful. We are thankful for all the prayers and messages of support that we have received during this period. Regiane's full recovery from her surgery and her return to full activities. Daniel has been kept quite busy during this time, especially needing to take on extra duties associated with the Action Team. A recent book published by Routledge on Church Growth in London has a chapter by Daniel on Brazilian churches, which allows him to say that the Lima Seminary is known internationally. Daniel as he seeks to balance all the different things that need to be done until the end of the year. Ana continues to do well in her school. This month she has had the opportunity to travel to Paracas in the South of Peru for Outside Education. Ana Sophia as she gets ready for her end of term exams. A few days ago, Daniel attended a meeting for Lima Pastors. The reflection was led by Ps Ps Ramon Correa, a masters' student who is also a seminary teacher, on contemporary theological trends. Daniel was pleasantly surprised to see the teacher continuously refer to the textbook Daniel had written for the course, especially considering the long hours that had gone into preparing it. This encapsulates exactly what we are seeking to do in Peru, prepare and provide resources for local leaders so that they can be better responsible for the development of Baptist work in Peru. Of course, things should never be a one-way street. During his presentation, Pastor Ramon provided biographical insight into the impact of three different inter denominational streams in Peruvian which he believed confirmed Daniel's "eclipse and fragmentation" approach to modern theology. Another pastor present emphasised the importance of the Independent Baptists in Peru who provide a separate theological stream. All this was a healthy reminder that theological education is about dialogue and learning together. Consequently, Daniel has asked both ministers if they can write up some of their ideas for him to incorporate into his textbook. 1. For the Master's students who are finishing their dissertations under Daniel's supervision. 2. For Regiane and Pastor Homero as they plan the activities of the Social Action Department for 2019. 3. For the emergence of a new generation of pastors and theological leaders among Peruvian Baptists. As the year ends with much uncertainty about the future across the globe, we can approach it confident in the fact that we are being guarded by God's power. God Bless, Daniel, Regiane and Ana Sophia. Congratulations to all those who survived the “Beast from the East”. No such extremes of cold weather here in Peru as we are coming to the end of our summer. Much of our time since our latest prayer letter has been involved in preparation, as we get ready for the new academic year at the Seminary and start executing the yearly plan of the Social Action Department of the Convention. Much of our work with the Social Action department continues to involve the city of Piura in the North of Peru, which is still suffering the aftermath of the floods from last year. At the end of February, we went up there for a weekend. Regiane led a seminar with pastors and church leaders on the role of the church in the community and Daniel advised some of the ministers on project proposals they are seeking to submit. On the Sunday Daniel was invited to preach at two very different churches. In the morning we were at the First Baptist Church of Piura which is one of the largest Baptist churches in Peru. It holds two services every morning, with a congregation of over 200 people in each service. In the evening we were at Betania Baptist Church, a smaller congregation, of about 50 people, meeting in a building which had been seriously damaged in last year’s floods. In the chaos of conferences and sermons Daniel went up to preach and realised he had brought the wrong set of notes! Fortunately, he could remember his sermon well enough to preach from memory. • We are grateful for safe travel to and from Piura and a very productive weekend spent there. • In our last prayer letter, we asked for prayers for the Peruvian Baptist Convention’s annual assembly. Thankfully all went well at the Convention and even potentially controversial issues were handled peacefully and with a Christian spirit. • In our last prayer letter, we asked for prayers for Daniel’s parents’ time in Peru. We had a very good time together and they had a full experience of Peru, including a 6,9 earthquake. • In the month of February students from the seminary went on a mission trip to Piura, a project supported by BMS World Mission. Although we were not able to go this time, as it clashed with Ana’s school restarting, it was a successful trip, with a deep impact on the students involved. • Please pray for the new leadership of the Convention, appointed in January that they may be blessed as they settle into their new role. Please pray for those involved in restructuring the Convention’s missionary department, a strategically vital component of the convention’s ministry. • Please pray for the new academic year at the Seminary. In 2018 we plan to open two new courses, 1) a training course for Sunday School teachers and 2) a Master’s in Urban Ministry, an extension of the current master’s course to graduates from other fields. • Please pray for Daniel as he teaches Old Testament Theology and Contemporary Ethics on the undergraduate course and supervises dissertations on the Master’s course. • Please pray for Regiane as she assists the Seminary administrator and coordinates the Student placement module. • One area of continuity within the convention is the Social Action Department, as Pastor Homero was re-elected as its head. We have developed a very good relationship with Pastor Homero and are therefore pleased to be able to develop this further. Please pray for Pastor Homero that he may be given wisdom to implement God’s purpose for the convention. • Please pray for Regiane as she works with Pastor Homero in developing the ministry of the Social Action Department and supports Bethel Baptist Church’s plants in Pilares and Ñaña. • Please pray for Ana as she settles back into the routine of school. It would be great to be able to see those who have been so faithfully praying for us in person. We hope you had a wonderful Christmas and God’s blessings for the year ahead. It is nearly two years since we arrived in Peru. A big thank you to all those who have prayed for us as we have gone along this journey, you have a fundamental role in all that we are doing here. December was a busy month as we prepared for our first Christmas, Navidad, here in Peru. Christmas celebrations began early in December as we participated in the Seminary’s Christmas celebration and the Christmas meal for the Baptist Pastors of the Lima and Callao districts. This was followed by a trip to our church’s outreach programme in Ñaña on the 17th to share hot chocolate, Panettones (traditional fruit cakes) and presents for the children. Our Christmas service at church was on the 24th, for which Daniel was invited to preach, possibly for his great hermeneutical and homiletical skills, but probably because there was a full programme and his sermons tend to be shorter than the Peruvian average! Christmas celebrations in Peru, as in much of Latin America, take place on the 24th so we were invited to a Christmas meal with 3-4 families from church. This was not the end of festivities as New Year’s Eve is also a major celebration in Peru, so we were again invited to a meal with 5-6 families from church, which was followed by a sleep-over for Ana Sophia. • We shared in our previous prayer letter some of the difficulties we were facing in having our visas renewed and which led to our home assignment being delayed. Thankfully, these problems have now been sorted out and our status has been regularised again. Fortunately, we were able to find a very good, Christian, immigration lawyer who helped us with the process and we are grateful for all those who have been praying for this issue. • In the last prayer letter we also shared about a proposed journey to Piura in the North of Peru. We are grateful that the journey went smoothly, and was very important in enabling us to develop a clearer picture of some of the needs of some of the communities who were badly affected by the floods at the beginning of the year. • Regiane has made a full recovery from her wrist operation. • Ana Sophia has finished another term at school. She really loves her school and has made many friends, in fact it is sometimes a struggle to keep up with her busy social life. • The academic year at the seminary runs from February-November with the graduation service being held in December. This year we had 3 students receive a diploma in theology and one receive their degree. We are grateful for the Lord’s blessing and the way he has sustained these students in the very challenging circumstances that they face. • We are grateful for the friends we have made here in Peru, with whom we were able to celebrate Christmas and New Year. • There were approximately 100 children and almost the same number of adults at our Christmas event in Ñaña. At one point it looked as if our supplies, especially of presents, would not be enough, but with God’s grace we were able to cross the finishing line. always necessary process of writing project proposals and grant applications. Please pray for wisdom in developing viable and relevant projects which can receive the necessary support. • Please pray that these communities are protected from any further disasters or hazards in the coming months. • In the beginning of December, the Baptist Association of Lima and Callao held its elections. Daniel was nominated to be the director of the newly-formed Department of Theological Education and Christian Education. In practice, this ends up being an extension of his existing consultancy work with the seminary, although a significant issue will be to clarify the exact nature of the relationship between this department and the seminary. • The Baptist Convention has its national assembly from the 23-25th of January here in Lima. This meeting involves the appointment of the Junta Directiva (equivalent to a Board of Trustees) for the next three years and the leaders of the different departments of the Convention. Please pray for God’s blessing upon the assembly and the appointment of this new leadership. • As we were forced to delay our home assignment my parents have decided to visit us in January. Fortunately this means that they will be here for Ana Sophia’s birthday. Please pray for safe travel and a positive time together. 2018 starts with much uncertainty in Peru. The political scenario, as those who follow the news are aware of, is chaotic and polarized. The government have announced that 2018 is the year of dialogue and national reconciliation. Yet, as Christians, we know that the One who has achieved reconciliation between humans and God is with us, and that in Jesus, we can face the year with confidence. Looking back on the challenges and the blessings of the previous months it is clear how important each person who prays for us is. It is a privilege to partner in mission with each one of our prayer letter readers and we look forward to sharing in much in the times ahead and hopefully see some of you in person when we do our home assignment next year. As some may already be aware we were forced to postpone our Home Assignment which was due to take place in December and January. The reason is that due to bureaucratic problems with the Baptist Convention they were unable to provide us with the papers necessary for us to apply for our visa renewal at Migraciones, the Peruvian migration department. Under Peruvian legislation foreign residents are not allowed to leave the country until their situation is regularized. Fortunately, the Convention has now overcome its bureaucratic problems and has provided us with the required paperwork and our papers are now in the hands of lawyers, so we should hopefully be in a regular situation once more. Despite missing out on the delights of a British winter this will allow us to experience our first Christmas in Peru, having been in Brazil last year. 1. In September Daniel was invited to present a paper on Biblical hermeneutics at the Theological Conference of the Baptist Convention, at the Shirán Centre near Trujillo on the northern coast of Peru. We are grateful for the safe travel for this journey and for the way in which the conference went well. 2. This term Regiane has had the opportunity to supervise the practical ministry of students at the Seminary. We are grateful for this opportunity to integrate academic learning with practical ministry. 3. Over the last months Regiane has been struggling with pain in her wrist due to a couple of cysts. In October, she was able to have surgery on her left wrist. This surgery was successful and the recovery is going well. 4. Regiane was able to recover in time to help organise a medical campaign in Ñaña. With the assistance of a doctor, a dentist and a nurse our church was able to provide assistance for forty children and forty adults. We are grateful for all those who were helped during this campaign. 5. A couple of days before the campaign Regiane and others in the church involved in the organization were concerned because they still did not have the funds to purchase the medicine for the campaign. Meanwhile Ana had been out with some friends from school and one of the mothers came over with her daughter to drop Ana off. As they were chatting Regiane’s phone went off and she started to talk with someone from the church regarding the final preparations for the campaign. 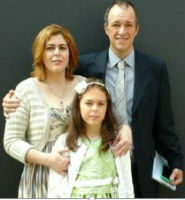 This piqued the mother’s interest and she asked Regiane whether the church still needed any donations for the campaign. The end result is that we received enough medicine for 2-3 medical campaigns. We are grateful for the way in which God provides support even from unexpected sources, and for the faithful prayers which ensure that such "coincidences" happen. 1. Please pray that the renewal of all our visas may go through smoothly. 2. This month we are travelling up to Piura, in the north of Peru, close to the border with Ecuador. This is an area which was drastically affected by the floods and landslides which came as a result of the El Niño phenomenon in the first quarter of this year. There are still many families facing the consequences of this disaster, living in temporary accommodation, often tents, and still lacking basic supplies. We are travelling with the President of the Social Action Department of the Convention to see in what ways the department and the BMS can help churches engage with their communities in these difficult times. Please pray for wisdom and discernment as we seek to explore the best way ahead. 3. Please pray for the ministry of the Seminary as we draw near to the end of another academic year. From our perspective, this involves Regiane chasing up reports from students and placement supervisors, and much marking and planning for the next year. 4. Over the next year a new leadership will be elected both for the Lima and Callao Baptist Association and the national convention. Please pray for the new leadership as they settle into their new roles. Much has happened since our last prayer letter, and there is much to be grateful to the Lord for. Safe travels Over June and July, we did quite a bit of traveling. First up was a plane trip to Chiclayo on the north coast of Peru. From there we took a very old coach for an eight hour journey to the town of Huamarca, at an altitude of 2,300 metres in the Andes. The last leg of the journey was on a winding, narrow road up the mountains, at times driving by precipices 3,000 metres up. We were travelling with Pastor Homero of the Social Action Department of the Baptist Convention, to help lead a workshop on social action for the local association. Soon after we were returning to the city of Arequipa, in the Andes to the south of Lima. We were travelling with seminary students on a BMS sponsored mission trip to work with local Baptist churches. Our time there involved: nearly bumping into the Peruvian president at the airport (surely the highlight of his year so far), mission work in a local state secondary school, visits to drug rehabilitation centres, and outreach work in church plants in deprived communities. We are very grateful for the Lord’s protection in all these travels and reminded yet again of the importance of those who pray regularly for us. End of Term Our academic year at the Seminary runs from March to December, with a brief break in July. One of the highlights of the end of the first term was the opportunity to run a theological conference led by the Master’s Students. Daniel was particularly happy to witness the high quality of papers presented by his students. We have also finished our audit of student records since 2005 and have ensured that student records are now up to date and easily accessible. In our last prayer letter, we mentioned that we were involved in assisting the Convention in their Stewardship programme. One of the priorities was finding a national pastor to take over the coordination of this programme. Thankfully this person, Pastor Carlos Palacios, from Cajamarca, has been appointed and is due to start in January. 1) A new term has begun at the Seminary. Please pray for Daniel as he teaches Advanced Biblical Hermeneutics on the Master’s Course and Biblical Eschatology on the undergraduate course. I am sure that some readers of this blog have had the experience of providing the wine/grape juice for communion. This usually involves going to the local supermarket and buying the suitable beverage. As our church uses non-alcoholic communion wine, Regiane simply thought that all that would be required is a trip to the local supermarket to purchase enough bottles of grape juice. However, there was a catch she wasn’t aware of, for our church uses homemade non-alcoholic communion wine. A trip to Magdalena street market to purchase the right type of grapes. Cooking the grapes in boiling water. Waiting for the grapes to cool. Straining the grapes many times. Using Daniel as a wine-tester. Delicious. Shame no one is allowed seconds at communion. One of the surprises that we had when we went to take the aid (see previous post) was that we discovered that the old bridge which led to the communities had been declared too dangerous for vehicle use, and was being restricted to foot traffic. Nonetheless, the police, upon realising that we were bringing aid, allowed us to use the bridge.In fact, it was all much safer than it sounds and the story feels scarier when told in retrospect than when we were actually crossing the bridge. Nonetheless, those responsible for BMS Insurance Premiums may be relieved to know we took the long route back! The flooding across Peru has made the front page of the BBC Website! The situation is particularly desperate in cities on the Northern coast of Peru, such as Piura, Trujillo and Chiclayo and in the poorer communities which surround Lima. What has often happened is that as people have moved to Lima they have settled along the banks of the different rivers which feed into Lima, especially the Rimac river, as land there was cheap or even free. 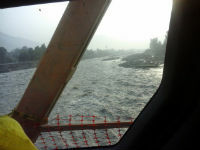 As the years have gone by without a major rain, houses have moved further inwards and often the river itself has been used to dump rubbish.Now, with the heaviest rains in the last three decades, the rivers have returned with a vengeance. Sadly, those who have very little, have suddenly found themselves losing the little that they possessed. Nonetheless, like a boxer recovering from a series of blows, there are signs that Peruvian society is starting to respond to the situation. State help is starting to reach different areas, and both Ana’s school and the Baptist convention are setting up distribution centres for people to bring donations. Evidently the most serious issue is what happens after the disaster is over because simply to return to the previous situation, while in itself a challenge, is hardly ideal, as many of these communities are vulnerable to other natural disasters, especially earthquakes which are always a concern in Peru. That is where BMS has already been ahead of the game as last year in partnership with the social action department of the Baptist convention nearly a 100 homes in Piura received support to become more resilient against natural disasters, both through training courses and the strengthening of the roofs of their homes. Personally, we continue to be inconvenienced rather than suffering from the disaster. Ana is now off school until Wednesday and I am unsure what is happening with regards to seminary classes. Water supply has returned which is a relief as there is no bottled water to be found in Lima and fortunately we have not had to raid our emergency pack, which is really for earthquakes. The most difficult part is having to see the impact on people that we know, one of our students at the seminary provides daily updates on how high the water is in relation to his house. Once again we value all your prayers. Recently we have been observers of political events over which we have no influence. The EU referendum in the UK, the impeachment of Dilma Rousseff in Brazil and the Peruvian presidential elections have all had much media coverage. Much has also been made in the media of Leicester’s dramatic triumph in the Premiership, and the odds that you could have been given for betting on this victory a year ago. It is interesting to wonder what odds one would have been given two thousand years ago when Jesus was crucified and his disciples scattered, on the likelihood of the movement he started outlasting the Roman Empire. We are truly blessed to serve a kingdom that will not end and will outlast all other kingdoms. Much of our work with the Seminary at the moment has involved preparation and administrative matters. We continue the process of cataloguing and preparing library books. Daniel was asked to help with course structure as the Seminary wishes to have a new Diploma in Theology course. The end result is a proposal for a three-year Diploma course to be followed by 18 months specialisation either in Pastoral Ministry or in Music and Christian Education leading to a degree. The next stage is to manage the transition into the new structure so that no existing students are negatively affected. The Master’s course is coming to the end of its first term. For students this means a considerable amount of hard work as they seek to get their work in on time. This involves the supervised research project which Daniel has been responsible for and includes projects on topics such as the ministry of women in local churches; single parenthood; churches and cohabitation; domestic violence and the role of Christian schools in preventing juvenile recruitment to gangs. The pace of social changes and the pressures upon families are a major theme here in Lima and thus we participated in a family retreat run by Bethel Baptist Church at which Daniel was a guest speaker. Two of the most debated topics were the role of fathers in the day to day lives of their children and the impact of social media on the family. Regiane continues to make her comeback after her surgery. Currently she is becoming more involved on the administrative side at the seminary, an area in which much is required. She is also working with Bethel Christian School as a means to better understand the social and cultural reality in Peru. This involves helping with devotionals at the school, providing pastoral care for challenging students and their families and teaching English to students and their parents in an after-school club. Ana Sophia is finishing her final year of primary school at the International Christian School of Lima. Fortunately, she can stay in the same school for “middle school” as she has settled in very well. She has also managed to make friends at church and is slowly becoming more comfortable with Spanish. • Last Sunday was the second round of the Peruvian elections. At the time of writing, even with 99.5% of the votes counted it is too close for an official pronouncement to be made. The country is basically divided between Fujimoristas who support the imprisoned former President Alberto Fujimori and his daughter Keiko who is running for office and anti-fujimoristas. Please pray that the new president may be able to work towards reconciliation. • We are grateful for the Spanish classes that we have had at the El Sol School. However, it is quite a long commute to the school. Please pray that we can find tuition nearer to us in San Miguel. • Please pray for Regiane and her ministry with the Christian School in Callao. Please also pray for more opportunities to be involved in social work here in Lima. • Next term Daniel will be teaching Church History for the Master’s course and Systematic Theology on the Diploma Level course. Please pray for him as he seeks to prepare these classes in Spanish. • Please pray for Ana as she ends primary school and makes the transition into middle school. Please pray for her as she continues to build up her confidence in Spanish. • Please pray for our visas to come through smoothly, now that the process has been set in motion. Woke up at 5:30 am, left home at 6:20, managed to get 6:40 bus with Ana to her school. Driver decided he was Lewis Hamilton’s long lost cousin so arrive at 7:00. School only opens at 7:45 so we went to the nearby park to wait. Ana started to have a nap, so I took out my mobile and start reading articles that I have saved on Pocket. Read an article by an evolutionary biologist arguing that as evolution is linked to survival, our beliefs will not be true, only those beliefs that will help us survive. Not the first time I encounter this argument, met it for the first time in an article by Christian philosopher Alvin Plantinga. Read article by Dilbert creator Scott Adams, who takes this further to argue that this would mean that belief in evolution itself is only for survival purposes and all our understanding of reality would be an illusion. Reminds me of the time that I spent a day trying to decide if the tree in Redcliffe college gardens was really there, decided that trying to refute the radical sceptic is a waste of time. Fortunately the Holy Spirit testifies to our spirits that we are children of God and this implies a real God and a real universe. Read the report of a conference discussing the likelihood that we are really in a simulated universe. One top astrophysicist (grateful for spell checker here) argued that as there is evidence that the universe exhibits characteristics of being programmed, we must be in a simulated universe. Surely the evidence that applies to a programmer would apply to a creator? A computer programmer argued that as a future (super) human race would likely develop various simulation models it is more likely that we are part of one of the simulations than the original. Not sure that this is what GK Chesterton meant when he said that when men stopped believing in God they started believing in anything but he would probably regard this as an example. Christians are often overly defensive, conceding too much to those who would present our faith as irrational. Rather the Christian tradition has always emphasised “faith seeking understanding” and good, solid faith leads to a far better level of understanding (check out the video of Richard Dawkins and a top Princeton ethicist advocating infanticide to see where the alternative leads). As we turned up to the inaugural service of the Seminario Evangélico Bautista de Lima (SEBAL) in the busy Lima city centre, we were surprised to see how dark everything seemed. As we walked up the dark staircase and turned into the main room we saw that there were only candles to provide light. Apparently there had been a power cut which had affected our side of the street. Nonetheless our principal, Júlio Gonzales was undeterred and used the situation as a lead in to his sermon on Jesus as the Light of the World. It was a powerful reminder not only of how God can change problems into opportunities, but also of how Jesus is present with us in all situations. We are grateful for safe travel to Peru and in the country including our trip to the Baptist Assembly in Shirán near Trujillo. We are grateful for all the people we were able to meet at the convention, including the opportunity to hear the Latin American theological legend, Samuel Escobar, speak. This assembly was the 50th anniversary of the convention and a reminder of all the work that God has been doing through Baptists in Peru. We are grateful for Ana Sophia’s new school. She is now at the International Christian School of Lima. It is an American school which offers both a good quality education, in English and Spanish and has a very strong Christian ethos. She is very glad to be part of the Basketball club and for the chance to take the boys on at football (she refuses to call it soccer). We are grateful for the success of Regiane’s parathyroid surgery. This took place at the Good Hope Clinic on Thursday March 17th, which was recommended to us by Margaret Swires. God placed a very careful and meticulous doctor in our path who insisted on finding the precise place of the gland which needed to be removed - which was just as well as the gland was located in a tricky place, behind the thyroid and her vocal chords. It is an Adventist clinic and the nurses all gathered round Regiane to pray for her before the operation. Regiane is grateful that her voice has been unaffected by the surgery and is now at home recovering. We are grateful for the flat we have moved into in the San Miguel district in Lima. The landlords are members of the church we have been attending and have been very helpful in facilitating our move. It is one bus journey away from the Seminary, one bus journey away from the church we are going to and one bus journey away from Ana’s school. We are grateful for the warm welcome that we have received at Bethel Baptist Church in Callao where we have been attending since coming to Lima. We are grateful for the start of the academic year at the Baptist Seminary. After about a month in Lima we are now starting to learn our way around the city. Regiane is an able negotiator with the taxi drivers to get a fair fare, while Daniel is more of a bus person. Ana Sophia does not mind how she travels around as long as she is able to have a snooze on her way to and back from school. Please pray for us as we re-start our Spanish classes. We reached the end of the basic level prior to Regiane’s operation and will now be moving into the Intermediate class. Please pray for Ana as she studies Spanish at school that she may also pick up the language well. Please pray for the various students at the Seminary, many of whom have to balance their studies with full time jobs and church responsibilities. Please pray for the teaching staff, who are doing the Master’s course, that it may be a blessing in their lives and ministries. Please pray for Daniel as he seeks to help students in their readings and the research that they will initiate, on family life in Peru. Please pray that this research may be a useful resource for other churches and pastors. Please pray for Regiane as she oversees the administration of the Master’s course and helps with the wider administration of the Seminary. Please pray for us as we seek to help organise the Seminary’s library. Please pray for Regiane to find opportunities to put her Health and Social Care studies to good use here in Lima. Please pray for Ana as she continues to settle into Lima, at school and at Church. Please pray that our application process for Non-Catholic Missionary visas may go through smoothly. Once again we are very thankful and grateful for your interest and prayers for our ministry.